Well, the first Augsburg tour went on April 5th. My first Augsburg customer being from Estonia. She had a wonderful day (or so she claimed) and it was a beautiful day as well. Augsburg is refreshing after many years in Munich. The main thing that I find different is just the general attitude of the people. Augsburg isn’t so saturated with tour companies even though it has a more substantial history than Munich…but what really sticks in my mind from the Tuesday’s tour is the smell of the city. Downtown Munich or Berlin or Vienna is mostly shops, churches, palaces, but not food. Augsburg’s downtown area has food around every corner…and very international options as well…literally everywhere, it’s quite amazing what that does to my stomach after half a tour! For food alone…this tour is great. 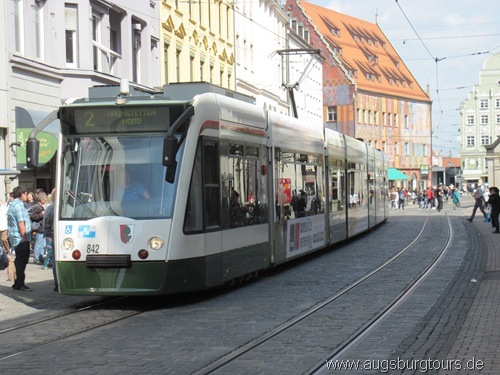 This entry was posted in tours and tagged 2011, Augsburg, Bavaria, Munich, Tours on April 7, 2011 by NOFXmike.